If you are a mom, you know that your children have strong opinions about what they want. When it comes to the holidays, those voices can grow a little louder, aided by wish lists and helpful hints about what gifts should appear in the home. But kids these days aren't just thinking about themselves, but rather offering well-informed opinions about the products and experiences that their moms should purchase for the loved ones in their lives. As part of the POPSUGAR Insights 2017 Holiday Report, we asked 3,000 US women to tell us how much their children influence their holiday gift shopping and where they go online to seek out holiday gift inspiration. Overall, nearly 80% of moms say that their children are influential when it comes to deciding which holiday gifts to purchase for themselves, their friends, or their family. Thirty-one percent of moms say that their children are extremely (13%) or very (17%) influential. Millennial moms (women between the ages of 25 and 34) are 15% more likely to say their kids are "extremely influential" when deciding what holiday gifts to purchase, but overall, millennial moms are slightly less likely (77%) to say their kids influence their holiday purchase. When it comes to gift discovery, moms say that lifestyle websites (34%) are the most inspiring destination to discover the holiday gifts to purchase for their children, followed by FB (21%), Pinterest (21%), and Instagram (10%). Millennial moms are 15% more likely than women overall to consider lifestyle websites (39%) the most inspiring destination for their kids' holiday gifts, followed by Pinterest (24%), Facebook (21%), and Instagram (12%). 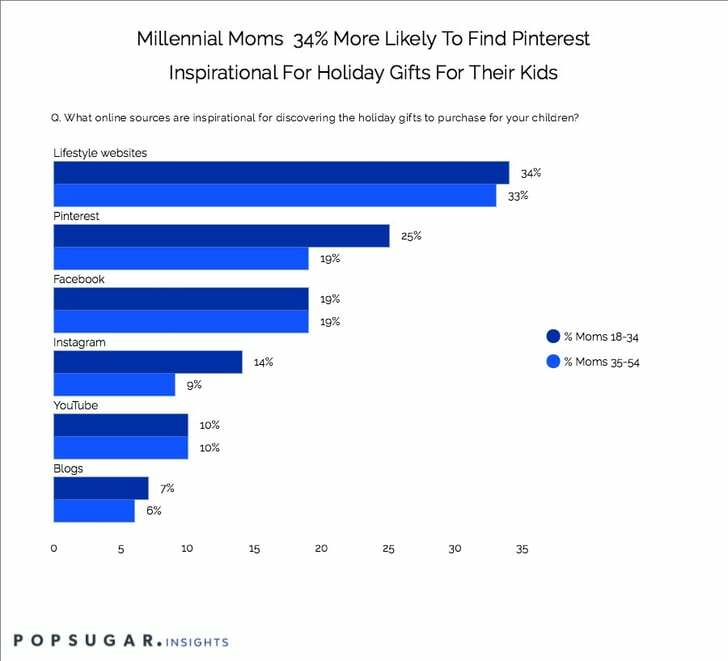 As compared to moms 35-54, millennial moms are 34% more likely to find Pinterest inspirational and 56% more likely to find Instagram inspirational for their kids' holiday gifts.